"The photo was taken on Two Mile reef at Sodwana at a depth of 15m. The two fish were found lying together in a large cup sponge. When coaxed out of the sponge the snapper remained very close to the Lionfish while it swam around. 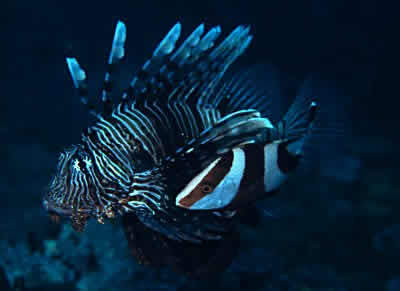 It even positioned itself between the Lionfish's pectoral fin and body. I think the photo is unusual as firstly I have never seen an Emperor snapper at Sodwana before and secondly the strange relationship between the two fish". Well done Dennis! Phil Heemstra says "Wow! that really is an unusual sight. I've never seen another fish nestled amongst the pectoral fin rays of a firefish". Considering the formidable defenses (venomous spines) and predatory nature of firefish, it's not surprising most fishes give them a wide berth - we wonder what this snapper was thinking; perhaps it was seeking (rather risky!) shelter in the "arms" of the firefish?